“I don’t know, but I’ll probably blame the English”. Doctor Who is back and it’s better than ever. Well, better than the last series at least. Don’t get me wrong, I enjoyed the Matt Smith years, but by the end of his run things were getting a little stale and the episodes just didn’t hit the high notes like the show used to. But with this new series, especially after the spectacular first and second episodes, I get the feeling this could be one of the best series to date. But let’s not get ahead of ourselves, the first episode ‘Deep Breath’ was a great start. Set in Victorian era London, the episode starts out with a Dinosaur in the Thames and the TARDIS being coughed up. After this, the episodes pace never lets up and we are thrust into the plot. Something something about people going missing; we see a man getting his eyes stolen and then the dinosuar in the Thames is killed in similar circumstances. Who’s doing this? Why? All of this doesn’t really matter, at least not at first, as firstly we meet the new Doctor, played by the brilliant Peter Capaldi. If, like me, you are also a fan of The Thick of It, it does take a minute to get used to Malcolm Tucker as the Doctor but after the initial shock it’s clear that Capaldi really wants to be here. He’s so good in the role, and doesn’t seem to be taken inspiration from the other Doctors and makes the role his own. You would think the episodes storyline and and villains are put to the side in favour of the new Doctor but, for the most part, this isn’t the case. The half face man/cyborg villain is a great mirror to the Doctor’s recent transformation and a great call back to the earlier Tennant episode ‘The Girl in The Fireplace.’ His stand off with the Doctor at the episodes climax is a particularly good moment, with a nice ambiguous outcome. The episode’s direction is also particularly good, with Kill List director Ben Wheatley matching the dark tone with suitable dark direction as well as some well needed flair. The supporting characters are also better than ever with the occasionally annoying Paternoster gang seeming less irritating than usual. In fact, I liked them this time. Apart from an oddly timed Lesbian kiss between Jenny and her lesbian lizard wife Vastra, the supporting characters were strong and surprisingly well written. Overall, Deep Breath was a strong opener for this series of Doctor Who. A great showcase of Peter Capaldi’s skills as the Doctor, and a very well made episode overall, it makes me once again excited to tune in to Doctor Who every week. The second episode of the newest series of Doctor Who is even better than the great opening episode, Deep Breath. After the events of last week wee see the Doctor flying by him self, rescuing a space fighter pilot who was about to die. After taking her back to her people, who are in the midst of a battle with the Daleks, they reveal that they have something special in their possession that requires the Doctor’s immediate attention: a good Dalek. Meanwhile, Clara is back on Earth where she meets fellow school teacher Danny Pink. While he didn’t do much this episode we did find some things out about his past as a soldier, and I can only assume he will be joining Clara and the Doctor for some adventures down the line. After picking Clara up, the Doctor and her are convinced to be shrunk down to enter the Dalek and find out what’s wrong with it, from the inside. 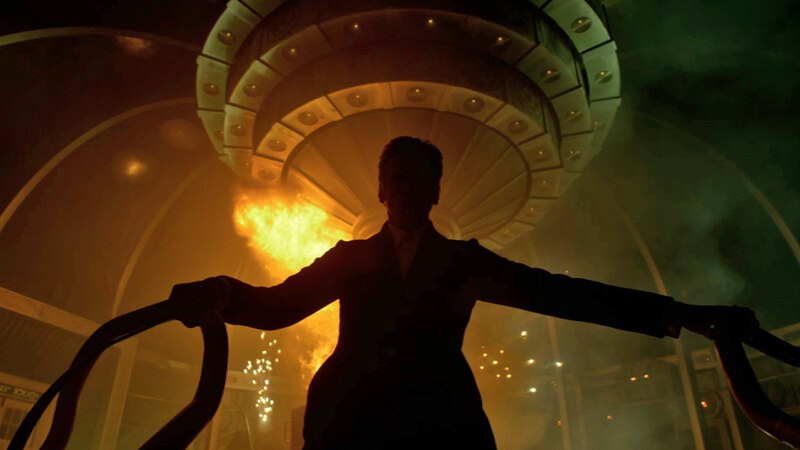 Again directed by Ben Wheatley, Into the Dalek is another fun episode which showcases Peter Capaldi’s Doctor while also being brilliantly directed. A stand out scene is when the Doctor is miniaturised and he and his tiny companions enter the Dalek through it’s eye stalk and we’re treated to an unusually awesome, trippy scene not often seen on Doctor Who. Hopefully the directors who take over from Wheatley can keep up this level of unusual and creative direction. The side characters in this episode are a little weak, but the always reliable Michael Smiley as the leader of the rebels was a cool surprise. The new male character that was introduced, Danny Pink, also shows promise and I look forward to him popping back up. Overall then, a pretty brilliant episode. 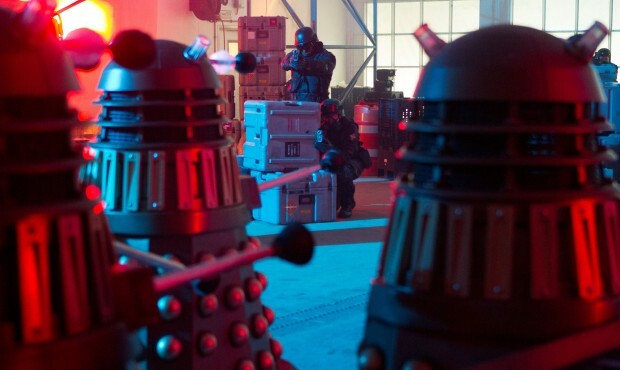 From the creative direction to great music to the awesome set design, Into the Dalek breathed life into the Daleks once again and continued breathing life into the Doctor Who franchise. If all of the episodes can be this good I think we could have one of the best series in a while.